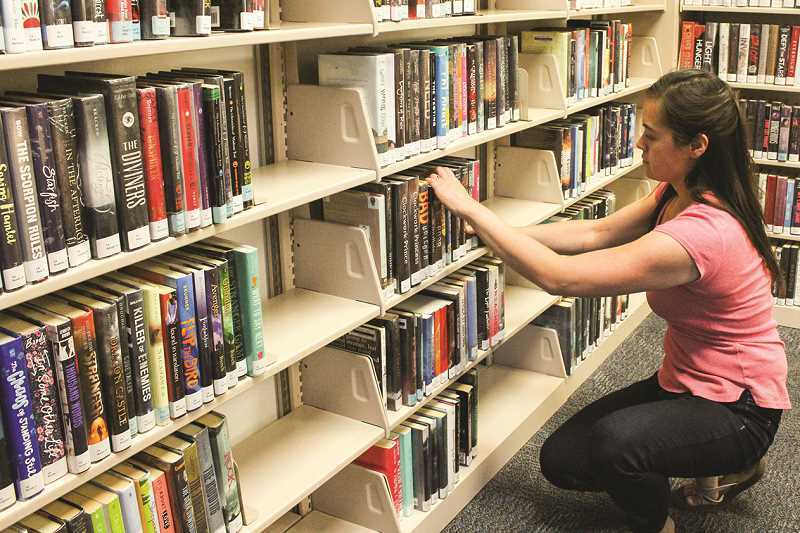 According to a recent social media post on a community public forum, virtually all of the shelves at the Crook County Library are only half full of books. The post went on to state that the library is getting rid of books that are no longer relevant, which sounded like someone's personal agenda was being implemented. But according to Library Director Buzzy Nielsen, there is no conspiracy theory going on and no "liberals in action" — as one Facebook post quipped regarding the book paring effort — it's just the librarians doing their regular "weeding." Just like homeowners need to purge items from their homes occasionally to live more comfortably, librarians must purge outdated and damaged materials from their shelves. "Our field is library science — there's a science to what we do," Nielsen said. In response to the accusations, Nielsen said he "posted about why we removed certain books and the various reasons, which have nothing to do with ideology, other than perhaps whether people in the community are interested in certain topics or not. If they're not, and they don't check stuff out, then it gets removed." He and his staff spend a lot of effort trying to weed their collection. "Obviously, people don't want to paw through a bunch of junk to find what they want, and also, we have limited space," he pointed out. Big academic libraries, such as the University of Oregon and Oregon State University, keep a lot of books, regardless of how often they circulate, Nielsen explained. "But public libraries typically don't serve an archival function except with local materials," he said. "We don't need to save all of the books that were popular fiction books from the 1950s because otherwise, we'd have to build bigger buildings." Nielsen noted that there are many reasons why they might remove a book, movie or audiobook from the local library's collection. Some items simply don't get checked out anymore. In many cases, they buy multiple copies of titles to keep up with demand, but after a while, when demand dwindles, they remove extra copies. Some items become outdated or inaccurate. For example, old travel guides, inaccurate medical resources, or titles that are no longer scientifically accurate. Other times, items get damaged or dirty or the binding falls apart. "All decisions to remove items are reviewed by one of our professional librarians, who are trained to make such assessments," Nielsen said. He pointed out that some collections have been weeded down more than others of late. A while back, one librarian did a "gentle" weed to the nonfiction collection, and more recently, Nielsen said, "We did a little bit less gentle weed of it because we still had a lot of stuff in there that was not relevant." The juvenile nonfiction and young adult collections also received some heavy weeding lately because a lot of the materials were simply outdated. "Many parts of our fiction section and our DVDs and our audio books were actually kind of close to bursting at the seams, so often times we do end up weeding those collections to make space for new materials," Nielsen said. He pointed out that patrons may also see some significant gaps on their shelves because they've been moving things around. "About a year-and-a-half ago, we started moving local history materials from the general nonfiction section into their own, special highlighted collections," he said. "That has resulted in some empty shelves while we shift to make room for other titles." Nielsen said they have increased the library's collection development budget this year. "A lot of that increase is going to digital, but some of it goes to print, too. Most of the increase to the print budget has gone to our nonfiction and juvenile nonfiction sections," he said, noting that this will help fill in the gaps left by materials they've removed as well as the gaps in subjects they've not covered. The books and materials that don't make the cut often get new homes. Some are sold in the Friends of the Library book sales, where they generate revenue to buy new materials. Other books go into the little free libraries that are scattered around the county. Still others are donated to assisted living facilities, homeless shelters and other such institutions. Some books are given to children or put on a shelf of free books in the lobby. "Just because an item is no longer needed at the library doesn't mean that someone else might want to take it home and love it as their own," Nielsen said.